Mobile banking in Canada recently received a further shot in the arm with Toronto Dominion (TD) Bank joining the ranks of other big Canadian banks offering an iPhone app for popular banking transactions. 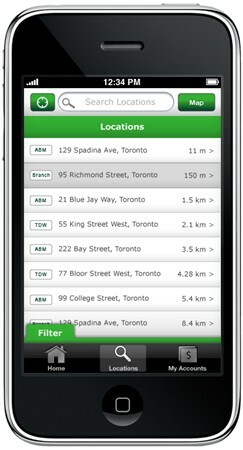 The TD mobile app for iPhone and iPod touch devices was launched April 14, and since then has been averaging more than 10,000 downloads per day, the bank says. “Checking account balances, money transfers between accounts, and bill payments are some popular transactions the application enables,” Joan Dal Bianco, vice-president, online channel, TD, told ITBusiness.ca. She said the app includes a North American branch locator, an ATM locator, and a wealth management locator. “It also provides telephone connectivity to our insurance business, as well as our wealth management business,” she said, alluding to the one-touch calling offered to TD Canada Trust, TD Waterhouse and TD Insurance. As of now, Dal Bianco said, the app is available to the bank’s Canadian customers, who could use the bank’s branch locator feature when they travel to the U.S.
She said per the most recent count, more than 108,000 people had downloaded the iPhone app – 12,000 of those using it to pay bills, another 18,000 – 20,000 to transfer funds between accounts. “Close to 50,000 people have used the branch locator.” They can do this, she said, without incurring any ATM fees. (TD has more than 5,000 ATMs on both sides of the border). Dal Bianco said checking account balances is by far the most popular use for the application. 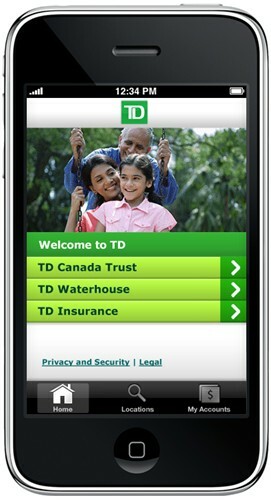 TD Bank’s iPhone app launch is the latest among similar launches by other major Canadian banks this year. CIBC was the first to the post with its banking app for iPhone/iPod Touch users unveiled in February. The application also enabled CIBC customers to check balances across multiple accounts, review transactions such as deposits and payments, pay bills, make account transfers, and locate bank branches and ATMs. Soon after Scotiabank offered downloadable mobile banking apps for the iPhone and BlackBerry that allowed users to locate nearby Scotiabank branches and ATM machines. In addition, the bank rolled out an InfoAlerts service that notifies customers of their account activity via text messages or e-mail. Scotiabank also offers a “mortgage iPhone app” targeted at potential new home buyers or those considering refinancing their existing home. The app helps them to calculate their maximum house price, an affordable mortgage, and payments. In March, ING Direct got on the bandwagon, launching a free mobile-banking application for both the BlackBerry and iPhone. It offered customers some of the same sought-after services: checking account balances, and funds transfer, the ability to locate ATMs, and to get directions and hours of operation for ING Direct Save Your Money Cafés. As of now only 9 per cent of Canadian customers have mobile banking accounts, according to Meracatus LLC. But 20 per cent plan to in the next year, the firms says. Entry of several big banks into the mobile banking fray is expected to fuel the trend, though adoption here is still slower here than in many other geographies. 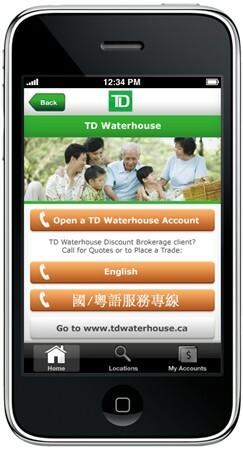 Now with TD Bank’s launch of the iPhone app mobile banking in Canada has got yet another shot in the arm. Despite the huge initial uptake for mobile banking apps, they aren’t going to replace online banking anytime soon, according to a Canadian analyst. “I see them as playing complementary roles,” said Rob Burbach, senior analyst, financial insights at IDC Canada in Toronto. Burbach predicts online banking will soon provide a lot of new functionality, which will be tightly integrated with bank accounts. Mobile will pick up a piece of what online banking does, but not everything, the IDC Canada analyst said. Meanwhile, reactions on the blogosphere to TD Bank’s iPhone application have generally been positive, though some users have expressed misgivings about the user interface, and other issues. “Usability could be a little better, comments user Zak2010 in the iPhoneinCanada.ca blog. “The amount of shading on line items is too much. Too much eye candy.” This user wants access to needed services “immediately and not a couple of screens down.” He also asks that the app support landscape as well as portrait orientation. Another user, “icemanyvr” says it was a “nice surprise” that the app offered access to TD Waterhouse investment accounts and TD Credit Cards, and asked that e-mail Interac money transfer services be provided at a later date. While the current version of TD Bank’s iPhone app is targeted at personal banking customers, Dal Bianco believes small business owners could also benefit. She said a small business customer, as much if not more than the personal account customer, is looking for opportunities to check account balances, make transfers between accounts, and pay bills. Moving forward, she said, the bank wanted to add “signing authority” to the features offered by the app. — another capability that would benefit small firms. The “cool factor and the desire to build brand loyalty, particularly among a younger demographic, are key drivers of the spate of mobile banking offerings, said Burbach from IDC Canada. Burbach doesn’t believe mobile apps will have any short-term positive impact on the revenues of banks offering them. The traditional driver of moving customers from higher-cost channels (branch transactions, teller lines, ATMs) to low-cost channels (online banking) doesn’t apply here, he said.